The March 2019 update of ArcGIS Online brings new ways to find, analyse and share GIS content. There are also administrative enhancements and a new look to the sign-in screen. Here are some of the key features. To get the most out of this, item owners must set the item's extent, or geographic boundaries. In another nice enhancement to searching for content, users are now given suggestions with partially entered keywords. Groups are an important mechanism in ArcGIS Online - for managing access and organising content. Often users will be looking for maps or apps, rather than layers. With this update group owners and managers can specify an item type to display on the Overview and Content tab of the group page. The Category Gallery (introduced in beta at the last release) is a really configurable way of setting up content galleries that support filtering on a range of options, including categories. You can also configure them to only show certain content types. Some of our customers run ArcGIS Online alongside their ArcGIS Enterprise deployment, using Distributed Collaboration to synchronise data. They can now share Hosted Feature Layer Views and Insights Workbooks through this. Tessellating polygons are a great way to aggregate data where there isn’t a meaningful set of areas to use. You can now create sets of tessellating polygons that can be reused for aggregating different datasets to a common set of areas. 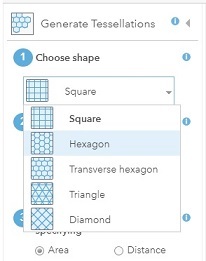 The new Generate Tessellations tool also gives a wider choice than the Aggregate Points tool- with squares, hexagons, triangles and diamonds. Access to the Create Watersheds, Create Viewshed and Trace Downstream has changed and the tools no longer cost credits to run. Geotagged photos can be loaded into ArcGIS, but imagine if you could just upload a zip file into ArcGIS Online and have them appear as a point feature layer with the images as attachments… well you can now. If you have geotagged JPEG files, you just have to use Add Item and follow the dialog - remembering to choose Photos with locations in the Contents option - and that’s it. For many audiences the legend is an essential visual reference for the data in the map. Where layers have multiple categories in their symbology these may be perceived as distinct layers by some people. The new Interactive Legend app template builds on this and lets the user filter layers by selecting which data is visible through an interactive legend. To further strengthen security practices ArcGIS Online now enforces rigorous password requirements. As well as a minimum requirement, a strength meter encourages users to choose more secure ones. A new Insights Analyst user type has been added to make it easier to open up access to ArcGIS Insights to users that don’t need any other capabilities. To see the full list of new features please read the what's new page.